A young East Bay man, who federal prosecutors say spoke of unleashing a wave of violent terror attacks across the Bay Area, pleaded guilty on Tuesday to providing material support to a foreign terrorist organization by opening multiple social media accounts for two ISIS sympathizers. Berkeley High School graduate Amer Sinan Alhaggagi, 23, entered the guilty plea in a federal courtroom packed with family members – almost a year after originally pleading not guilty last August. Alhaggagi’s attorney, Mary McNamara, said under the law, any support to a terrorist group – no matter how minor – makes a person guilty. She said there is no defense for her client’s decision to open the social media accounts but stressed all he did was open the accounts. She said he never planned to carry out any attack. “This is what’s happened in the country since 9/11,” McNamara said. “It captures people like Amer, who is a young, immature guy who never intended to do anything. Amer Alhaggagi's attorney, Mary McNamara, speaks to reporters after her client's guilty plea. Alhaggagi could face nearly five decades in federal prison for the creation of those social media accounts, and three other charges related to credit card fraud and identity theft. Friends and family of Alhaggagi who showed up to court declined to be interviewed, but said in a statement they hope the judge will understand that he is not a terrorist or violent person, despite some of the claims he made online. Federal prosecutors did not talk after the hearing, but they painted a much darker picture of the young man in court records. They allege Alhaggagi conspired to kill thousands of people across the Bay Area by blowing up gay night clubs, planting explosives on the University of California, Berkeley campus, and setting fire to the Berkeley Hills. It was the reference to the Berkeley Hills that prosecutors say allowed agents to narrow in on Alhaggagi. Initially, undercover agents were unaware of his real identity or where he lived. During a December detention hearing, federal prosecutors recounted online conversations they say Alhaggagi had with FBI informants posing as ISIS sympathizers. When Alhaggagi allegedly claimed he would join a local police department to steal weapons if he couldn’t make bombs himself, investigators began contacting Bay Area law enforcement agencies in a hunt for any leads. They eventually found an application that Alhaggagi had submitted to the Oakland Police Department, trying to become an officer. The FBI then used an undercover agent posing as an ISIS sympathizer to make direct contact with Alhaggagi, according to court records. 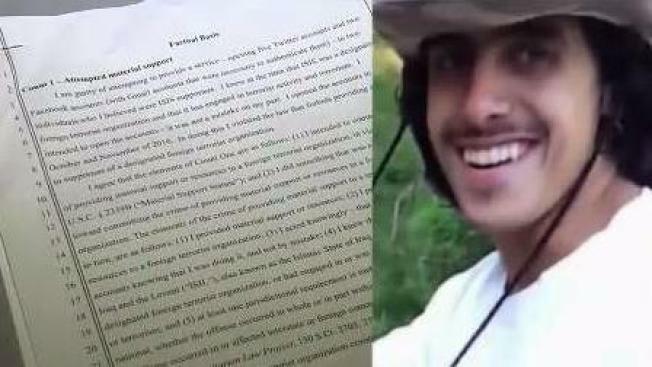 Prosecutors say Alhaggagi took that agent on a tour of the Bay Area to point out possible targets for an attack. But court records also show Alhaggagi later broke off contact with the agent. McNamara said that shows her client never actually intended to carry out a terrorist plot. Alhaggagi’s friends and family who spoke to NBC Bay Area last year said they were blindsided by his arrest. Alhaggagi’s friend, Suhaib Ahmed, had a similar reaction. Alhaggagi's sentencing is expected to take place this fall. NBC Bay Area will continue to update this story as we learn more.